Canterbury District Health Board is: the main planner and funder of health services in Canterbury; a tertiary provider of hospital and specialist services - both for the Canterbury population and also for the populations of other DHBs where more specialised services are unavailable; a promoter of our population's health and wellbeing; and the largest employer in the South Island, employing over 9,000 people across their services. 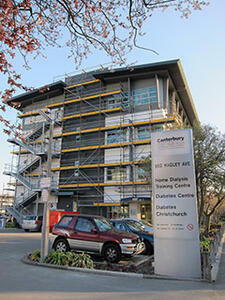 More than three years after that first earthquake struck Canterbury in September 2010, the Canterbury Health System is still in the midst of repairs, demolition and redevelopments. These significant projects affect all staff and people using their services in different ways. The landscape is altering regularly as damaged buildings come down, repairs and redevelopment work starts to take shape in other areas. Canterbury DHB say, "We would like to say thanks to all Canterbury Health professionals for the important role they play in making sure Canterbury people continue to receive the right care in the right place at the right time by the right person despite the ongoing environmental challenges. We’d like to thank the people who use our services for their patience while we make our health facilities better."